Cats' claws are important and necessary for balance and movement. They walk on their toes with their weight distributed across their back, shoulder, and joints. When the last digits of their toes are removed for declawing, the unnatural angle can cause chronic back pain. Declawing is a far cry from what some believe to be a "cat manicure." A claw is not a nail. Declawing, or onychectomy, involves 10 separate, painful amputations. The claw of a cat is actually so closely adhered to the bone that to remove the claw, the last bone of the cat's toe must be removed. This procedure is often compared to amputating all a human's fingers to the first knuckle. Laser surgery is another method of declawing. A small, intense beam of light is used to cut through tissue by heating and vaporizing it, with reduced pain and less bleeding. It is essentially the same procedure, just with different equipment and the same complications as amputation. A tendonectomy or tenectomy is severing the tendon between the cat’s second and third phalanx, or joints. In this surgery the cat keeps his claws, but he is unable to extend them. This procedure requires regular owner upkeep of the cat’s claws, particularly trimming, because the cat cannot scratch to remove nail husks while the claws continue to grow. While there have been changes in the methods of declawing, these surgical procedures are still unnecessary and inhumane. 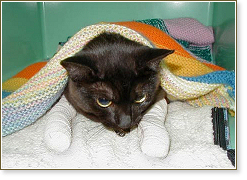 Recovery for cats after declawing surgery is extremely difficult. Physiologically, cats walk on their toes, so they are unable to walk until they are completely recovered, which may take many weeks. Immediately following surgery, many cats will experience complications such as pain, hemorrhage, lameness, and swelling. Continued complications can include infection, regrowth, bone protrusion into the pad of the paw, prolonged intermittent lameness, and abnormal standing posture. Cats use their claws for balance, jumping, climbing, self-defense, and grooming. A cat's claws are vital in providing protection; outdoors without claws, they are defenseless. The inhumanity of the procedure is clearly demonstrated by the nature of cats' recovery from anesthesia following the surgery. Unlike routine recoveries, including recovery from neutering surgeries, which are fairly peaceful, declawing surgery results in cats bouncing off the walls of the recovery cage because of excruciating pain....Declawing fits the dictionary definition of mutilation to a tee. Words such as deform, disfigure, disjoint, and dismember all apply to this surgery. Partial digital amputation is so horrible that it has been employed for torture of prisoners of war, and in veterinary medicine, the clinical procedure serves as a model of severe pain for testing the efficacy of analgesic drugs. Even though analgesic drugs can be used postoperatively, they rarely are, and their effects are incomplete and transient anyway, so sooner or later the pain will emerge. The trauma of declawing can lead to a feeling of defenselessness as well as ongoing pain, resulting in various emotional and behavioral complications. Often, after surgery, cats' personalities change: outgoing cats can become introverted and withdrawn, some become nervous and fearful, others develop aggressive behaviors (biting). Jean Hofve, DVM, states that scratching, for a cat, is not only a natural act physically, but a psychologically necessary one as well. Cats mark their territory visually, especially in multi-cat households, as a way of determining rank. Scratching is an essential element of cats’ communication, problem-solving, health, and security issues. Some cats associate the pain they feel in their paws when trying to cover their waste with the actual litterbox, so they will avoid the litterbox and seek a less painful place, such as the carpet, the bed, or piles of laundry. They may spend most of their time in out-of-reach locations (high shelves, the top of refrigerators) because they feel safer. These behaviors become a serious challenge for guardians who don't understand the cause and can find no way to resolve the problems: their cat has emotionally retreated, is constantly afraid, and is very difficult to live with. In many cases, declawed cats are rejected and sent to shelters where most of them are euthanized. Those veterinarians who suggest declawing justify it by saying that otherwise their clients would dispose of their cat, sometimes cruelly. It is an ethically inappropriate position. Some veterinarians have argued that some people would have their cats killed if declawing was not an option. We should not, however, allow ourselves to taken 'emotional hostage' like this. If a person really would kill her or his cat in this case, it is reasonable to question the suitability of that person as a feline guardian, especially when there are millions of non-declawed cats living in harmony with people. Declawed cats are more prone to disease because the post-surgical state of stress compromises their immune system. UPDATE: In November 2011, Israel banned the declawing of cats! Although declawing of cats by a veterinarian is legal in Israel, a Knesset member, Dr. Ahmed Tibi (a physician), proposed an amendment to the Animal Welfare Law that would make declawing illegal. But as of now, this is only a proposal. Declawing is illegal, or considered extremely inhumane, in over twenty countries around the world, including Australia, Austria, Belgium, Brazil, Denmark, Finland, France, Germany, Ireland, Italy, Japan, the Netherlands, New Zealand, Norway, Portugal, Spain, Sweden, Switzerland, and the UK. Nail trimming is a simple procedure, and if you wait until your cat is sleepy and quiet, and do one nail at a time over a period of several days, your cat will soon find out it's not to be feared. Lightly squeeze the cat's toe to extend the nail tip, and snip the tip. If you're scared of doing this yourself, ask your veterinarian to teach you. Cats cannot damage furniture, drapery, and rugs if they have blunt nails. Scratching posts are easy to find and easy to build yourself. Many cats enjoy sisal-covered posts, and cats can be easily trained to use them instead of furniture. Fortunately, one of the most popular surfaces is cardboard, and inexpensive cardboard scratching posts are available. If one post doesn't work, get a second one, and experiment with their locations. For more information, see Training Your Cat to Use the Scratching Post. Soft Paws are vinyl nail caps which glue right over a cat's claws. They even come in colors, making it easy to locate one if it should come off. The caps grow out with the natural growth of your cat’s nails, and last about four to six weeks.